Schulte Roth & Zabel presents the premiere of Theater of Law, a new co-production between Theater of War Productions and the Forum on Law, Culture & Society. Photo credit: Bruce Gilbert. From left to right: Thane Rosenbaum, director of Forum on Law, Culture & Society; Bryan Doerries, artistic director of Theater of War Productions; actor Zach Grenier; Christina Henry of Schulte Roth & Zabel; David Auxier-Loyola of Schulte Roth & Zabel; actress Kathryn Erbe; Schulte Roth & Zabel partner Dan A. Kusnetz; Sarah L. Huff of Schulte Roth & Zabel; actor Reg E. Cathey; actress Ana Reeder; and Jeffrey A. Lenobel, Schulte Roth & Zabel partner, chair of the Real Estate Group and a member of the Board of Directors of the Forum on Law, Culture & Society. 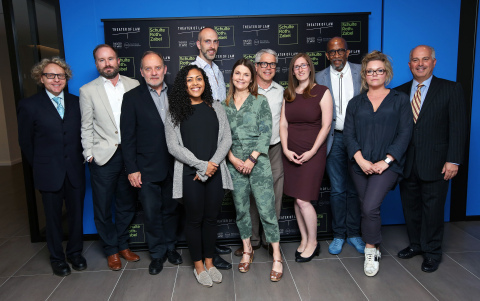 NEW YORK--(BUSINESS WIRE)--Leading law firm Schulte Roth & Zabel (SRZ) presented the premiere of Theater of Law, a new co-production between Theater of War Productions and the Forum on Law, Culture & Society. The event featured Emmy Award-winning actor Reg E. Cathey (The Wire, House of Cards, The Immortal Life of Henrietta Lacks), Tony Award-nominated actress Kathryn Erbe (Law & Order: Criminal Intent, Oz), Tony Award-nominated actor Zach Grenier (The Good Wife, Fight Club, Deadwood) and Obie Award-winning actress Ana Reeder (Hedda Gabler, Top Girls, Sight Unseen). Held at SRZ's New York office, the actors performed a dramatic reading and initiated audience discussions. Designed for legal professionals and for those who have had experiences with the legal system, Theater of Law is an innovative project that features readings from an ancient Greek tragedy about the first trial in Western culture, and is aimed at engaging audiences in constructive, thoughtful dialogues about the power of justice and the law, and its impact on local communities and society as a whole. "We are pleased to present the debut of Theater of Law. It is truly an innovative program that ignites thoughtful discussions about justice and today's legal system," commented Jeffrey A. Lenobel, SRZ partner and chair of the Real Estate Group. "Last night's performance was inspiring and, we are thrilled to say, the first of many exciting Theater of Law programs to be performed around the country," added SRZ finance partner Joel M. Simon. Mr. Lenobel and Mr. Simon serve on the Board of Directors of the Forum on Law, Culture & Society. Mr. Cathey, Ms. Erbe, Mr. Grenier and Ms. Reeder read excerpts from Eumenides, translated and directed by Bryan Doerries. The Greek dramatist Aeschylus, in his trilogy of revenge plays, Oresteia, concludes the cycle in Eumenides with the trial of Orestes — the son who kills his mother because she had murdered her husband, Orestes' father. It is the first trial presented in Western culture — judge, jury and the community watching from the gallery — ordered by the gods as a way of introducing the ancient Greeks to the virtues of a legal system and the end of self-initiated blood justice. "Theater of Law is an important work and we are delighted to host this premier performance," commented Alan S. Waldenberg, chair of SRZ's Executive Committee. "For most of human history, justice was a private affair — tribes, clans, families and individuals took matters into their own hands. This Greek play reminds us of the power of the court system as well as its impact," said Thane Rosenbaum, director of the Forum on Law, Culture & Society. "Theater of Law is a terrific opportunity for us to bring our work to the legal industry. We are thrilled that Schulte Roth & Zabel has made it possible for us to engage legal professionals in these crucial discussions," said Mr. Doerries, artistic director of Theater of War Productions. Theater of Law was developed by Theater of War Productions, a social-impact theater company that has worked with 200 leading film, theater and television actors to present dramatic readings of seminal plays — from classical Greek tragedies to modern and contemporary works — followed by public conversations in an interactive program designed to address urgent community-based social issues. Theater of Law is co-produced by the Forum on Law, Culture & Society. Schulte Roth & Zabel LLP (www.srz.com) is a full-service law firm with offices in New York, Washington, D.C. and London. As one of the leading law firms serving the financial services industry, the firm regularly advises clients on corporate and transactional matters, as well as providing counsel on regulatory, compliance, enforcement and investigative issues. The firm's practices include: bank regulatory; bankruptcy & creditors' rights litigation; broker-dealer regulatory & enforcement; business reorganization; complex commercial litigation; cybersecurity; distressed debt & claims trading; distressed investing; education law; employment & employee benefits; energy; environmental; finance; financial institutions; hedge funds; individual client services; insurance; intellectual property, sourcing & technology; investment management; litigation; mergers & acquisitions; PIPEs; private equity; real estate; real estate capital markets & REITs; real estate litigation; regulated funds; regulatory & compliance; securities & capital markets; securities enforcement; securities litigation; securitization; shareholder activism; structured finance & derivatives; tax; and white collar defense & government investigations. Theater of War Productions (www.theaterofwar.com) is a social-impact company that uses a combination of theater and guided public dialogue to help communities address pressing public health and social issues such as combat-related psychological injury, suicide, end-of-life care, police/community relations, prison reform, gun violence, political violence, natural and manmade disaster, domestic violence, substance abuse, and addiction. The Forum on Law, Culture & Society (www.forumonlawcultureandsociety.org) is committed to providing a unique, engaging, and entertaining experience for both a public and online audience in examining the big ideas of our day, including matters of law, justice, human rights and civil society by bringing together influential artists, government leaders and public intellectuals in a dynamic setting that is spirited, enriching and alive. Thane Rosenbaum serves as the director.